Doors and Haunted Playground open at 6:30pm. Haunted Playground closes 30 minutes after the Ghoullog. Wednesday, October 24th- Local’s Night- $20 tickets for Carroll, Coos and Oxford County residents. Must show ID for proof of residency. Friday, November 2nd- Ghoullog Lights Out! For one night only, all the lights in the Ghoullog will be off. 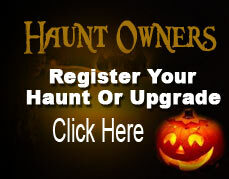 You’ll be given a glow stick to navigate your way through the haunt! Please note: The Ghoullog is recommended for ages 10 & over.